That is probably the most honest feedback/review I’ve seen on those mitts. Thanks for that!! And the stripped toddler EZ yoke is precious! Ah, it reminds me of when I knit a little dress for 2-year-old Daisy, who told me, on its completion, “Bwoo is ugwee.” She wouldn’t even try it on. Hopefully, Beatrix is less stubborn. 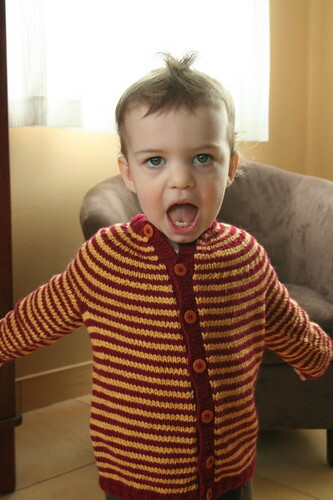 What a cute little cardigan, and the colors look nice togetehr too. My 7 yr old used to be the same, I dont like that (only because it wasnt the right color or something else), and then a few days later would wear it non-stop. They change their minds all the time about what they like and dont like I guess. One of things I love the best about your blog is that you show handknits from a few years ago and critique the yarn, hold-up-ability, etc! It is super helpful and I’ve made different design decisions based on the experiences that you post. There will be no chilly hands in those mitts, no matter how cold it is outside! The warmth seems worth it, even if they don’t wear incredibly well. I adore the stwipes and the thwums. And yes, very useful info as I venture into my own thrummed mitten territory. Although, mine are mostly for fun, as I don’t see any 5:30am runs in my future. I wish I could crawl inside the mittens! They look super cozy and warm – perfect for those early morning runs! First – you run in -10 degree weather???!!! That’s some serious dedication! 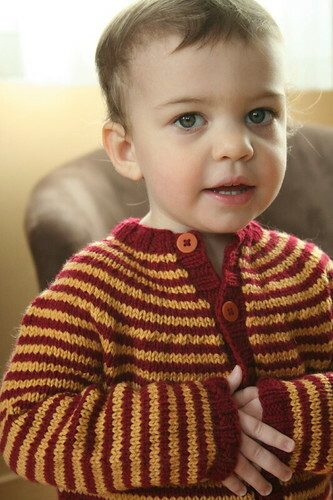 Beatrix’s sweater is rather cute on her, they are very Gryffindor style colors. 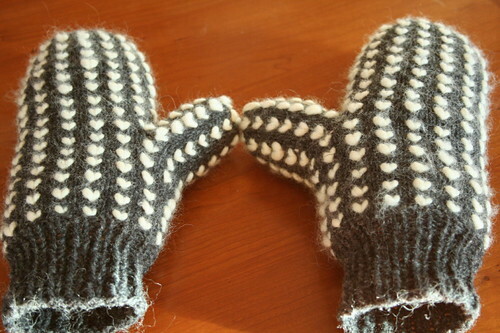 Your aunt’s thrummed mittens look so cozy, who would care about the pilling? I love that tufty-topped picture of Beatrice in her adorable new sweater! I so want to make a pair of these mittens in time to wear them this winter, but I also want to finish some of the WIPs and promised gifts that are yet to be knit. Oh, the dilemmas. I love that little cardigan! 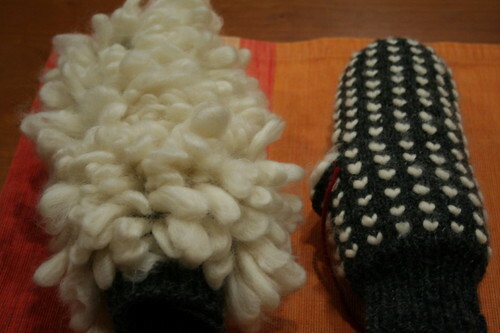 I also love your thrummed mittens. One of these days I really need to bust out my roving and make some. Oh, sigh… why is your daughter so adorable?!? 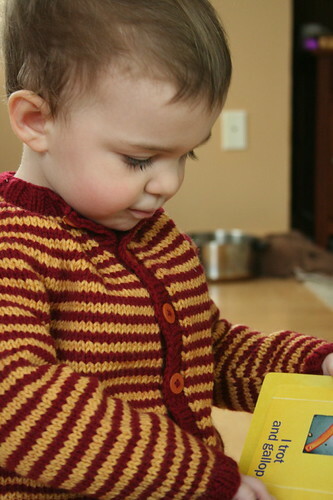 Between the cuteness of the sweater, her hair, and her little kid language (stwipes! ha! ), it’s all too much! Also, those thrummed mitts are serious. I mean, is there even space in there for hands?!? Those mittens hardly need hands in them! Cute little cardigan! 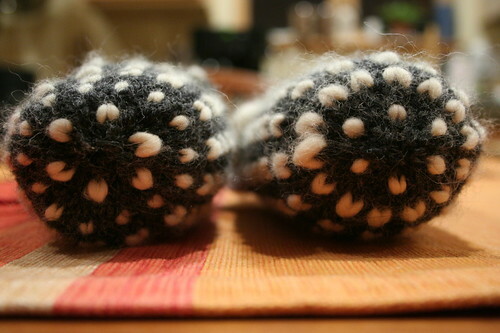 I made thrummed mitts for two of my daughters a few years ago… I wonder if they’re still wearing them?! Cute cardigan and mitts! Is her hair starting to curl? She’s so adorable. I love the mittens! (the sweater is nice too!) 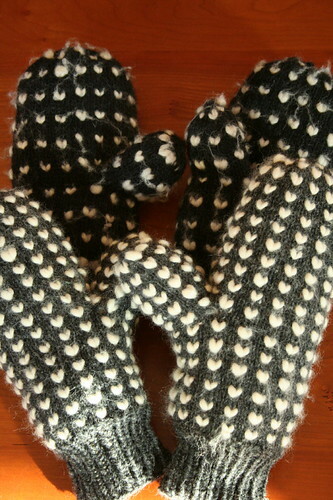 I made some thrummed mittens a few months ago, and wish I’d put in 300 thrums per mitten. And yours are so dense too! I’m sure she’ll love them! You really do knit the most beautiful stuff! Love the mitts! The sweater is adorable! Once again, I’m cruising the snow-packed blogosphere and I stumble across your footprints hundreds of miles from home. (http://knitorious.typepad.com/knitorious/2009/01/winter-is-dead-to-me.html) What’s up with that? …there have been plenty of mornings lately when I would have been delighted to have a pair of my own. Love your blog. Can you add me to your blogroll? thanks! Completely sweet sweater and model. 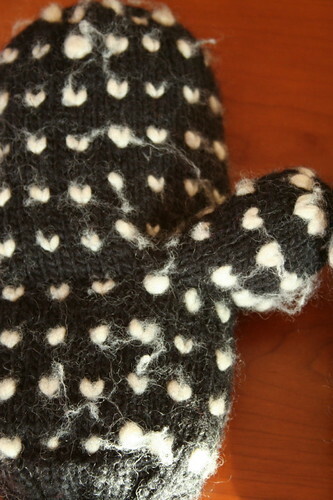 And that last photo of the mitts makes me smile! 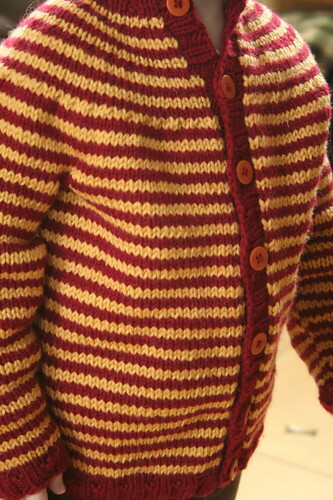 love Beatrix’s cardigan. very cute!